Dog lovers and non-dog lovers alike will tell you that sometimes, you can smell someone’s pet as soon as you walk into their home. While we love our fur babies, we don’t want ourselves or our guests to have to smell them as soon as we walk through the front door! Luckily, there are a couple of things you can do to prevent your home from smelling like a kennel. Ebay says the best place to start to prevent that doggy smell build up in your home is to make sure your pup is actually clean! 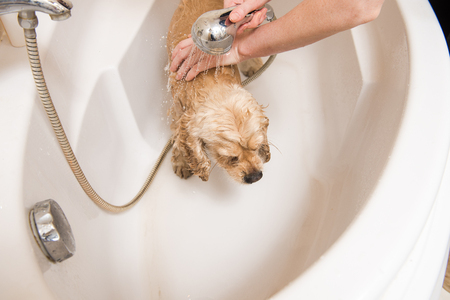 Regularly bathe and groom your dog, and make sure to use a gentle doggy shampoo. Over-washing your pup isn’t good for his hair or skin, but keeping him clean and fresh is the best way to keep your home clean, too. Pet owners who have carpeting in their home may not notice the build-up of hair that those of us with hardwood or tile can see on a daily basis. If you have carpet in your home, and you have a dog, make sure you’re vacuuming regularly, even if the carpet doesn’t seem dirty. Regular carpeting shampoos can also help keep your home smelling fresh and clean. You can also sprinkle the carpeting with baking soda and let it sit for a bit before you vacuum. That’ll take out any smells that are lingering in the threads. Just make sure your dog is somewhere else, so that he’s not licking at the baking soda! PetMD says that if you’re using a perfumed product to de-odorize the area, to make sure it’s non-toxic to pets. It’s important to use a doggy bed for your pup that has a removable cover that can be machine washed. Toss the cover in the laundry on a high-heat water setting at least twice a month. Click here to learn about the professional pet grooming services available here at Pauley’s Pups, and if you’re looking for a new pup to take home today, call us at (804)798-7877.